This article was originally published in Flagpole Magazine, April 8, 2009. Photographs by Andrew Flenniken. Not everyone loves it; H.L. Mencken reportedly described it as “a cross between a steam calliope and a Ukrainian peasant chorus.” Mencken notwithstanding, it sounds like nothing else you've ever heard. Four groups of singers face the center, raising their voices for no one but the song leader and themselves, harmonies meeting and diverging, wild but measured, eerie and joyful. This is Sacred Harp music. 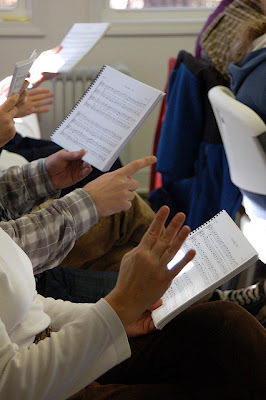 Sacred Harp is one example of a larger American shape-note tradition which began in the late eighteenth century, drawing from the rural church-singing tradition in England but adding innovations of composition and especially notation. A seven-note scale is represented by four (or sometimes seven) shapes which give the tradition its name. The purpose of the shapes is to make sight-reading easier; the larger purpose is to make music accessible to all. Singing-schools sprang up in New England and beyond, teaching the populace how to make a joyful noise. It may have been this populist and inclusive impulse which really disturbed Mencken, who was a cheerfully obnoxious elitist, but it contributed significantly to the original popularity and later resurgence of the style. Hugh McGraw, in blue sweater, sings along. Once popular all over the newly minted United States, the shape-note style eventually fell out of favor everywhere except the rural South. By the mid-twentieth century, the number of people who knew and practiced this uniquely American musical tradition had dwindled down to only a thousand, in a few churches in the deep South. However, a resurgence of interest in the style has occurred in recent decades, helped along by Hugh McGraw, Raymond Hamrick, and a group of others who published a new revision of the classic shape-note hymnal The Sacred Harp in 1991. First published in 1844, the title page reads “The Best Collection of Sacred Songs, Hymns, Odes, and Anthems Ever Offered the Singing Public for General Use.” That claim is supported by the fact that it has been in continual use since its first publication, with only four major revisions. Now there are regular “singings” all over the United States and well beyond. The South, especially Alabama and Georgia, is still the center of the tradition and if you attend a singing in Ila, Georgia, or Jasper, Alabama, you may encounter people who have driven down from Michigan or New York just to come and sing. For those who are fascinated by the form it is a powerful draw. There are shape-note singers who grew up with it in churches where the hymnals are still in ongoing use, or who heard about it from older relatives, but many more simply ran across it somewhere. They come from a wide variety of backgrounds, religious and musical, and may or may not be interested in Christian sacred music or folk music per se. They simply come for the singing. Musicians and Hollywood have taken notice: Three hymns from The Sacred Harp appear in the movie Cold Mountain (“I'm Going Home,” #282, “Vernon,” #95, and “Idumea,” #47). The soundtrack for Cold Mountain was compiled by T-Bone Burnett, the same man who brought you the “old-timey” sounds of O Brother! Where Art Thou? Georgia filmmakers Erica and Matt Hinton made a documentary about Sacred Harp titled Awake, My Soul. The soundtrack, called Help Me to Sing, features recordings of traditional Sacred Harp singers on one disk, and various musicians performing songs from the book on a second. On disk two you can hear Doc Watson singing his own version of “Idumea,” sometimes called “And Am I Born to Die?”; Rayna Gellert and John Paul Jones harmonize on “Blooming Youth” (#176), while Danielson performs a quirky, weird version of “Sermon on the Mount” (#507). Tracks by Liz Janes, Innocence Mission, The Good Players, Mac Powell, John Wesley Harding, Jim Lauderdale with Jeni & Billy, Cordelia's Dad, All Things Bright and Beautiful, Tenement Halls, Woven Hand, Richard Buckner, Sam Amidon, Rick Moody with Nina Katchadourian, Tim Eriksen, DM Stith, Murray Hammond, and Elvis Perkins in Dearland also appear. Other musicians have drawn on the shape-note tradition for inspiration or performance as well; “The Dying Californian” ( #410) is one of the tracks on the VOCO album Blink, while #47 is the title track on Am I Born to Die? An Appalachian Songbook by Mason Brown and Chipper Thompson. Judy Mincey leads the singing. 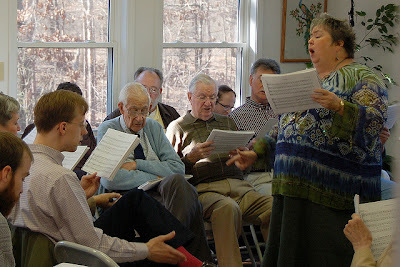 With traditional Sacred Harp, or the other shape-note traditions such as Southern Harmony or Christian Harmony, the point is not performance, but participation. Everyone who attends a singing is not only allowed but encouraged to sing, and nearly everyone who sings eventually gets up and leads a song. Singings are orderly, focused, and cheerful, accompanied by food and a good deal of laughter. Everyone is welcome, and welcome to sing. That is its power; among other things, it is a living folk musical tradition that has yet to be packaged or professionalized, and is easy to access if you are simply willing to put in the effort and time to show up and do it. It has a spiritual core which is inherently democratic and resistant to co-option. Along with the wild beauty of the harmonies, the music is participatory in its very essence. It is meant to be sung, not only listened to, and you are supposed to sing loud. Athens is close to shape-note central; there is a regular monthly singing at West End Baptist Church, and another in Ila, just down the road. The system is intended to be easy to learn and if you have any choral singing experience you will find it very easy to pick up (though you may have to unlearn some of your trained-in habits). 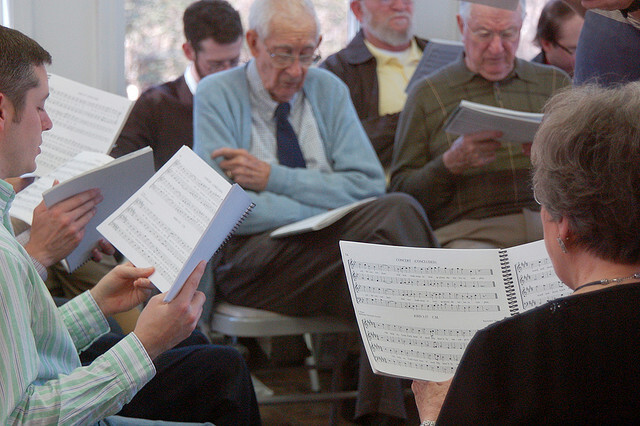 If you need a little more preparation, regular singings at the Emory Presbyterian Church in Decatur include a short explanation of the shape-note system and an opportunity to sing a probably-familiar tune in the shape-note style.“Old Hundred,” also known as “Doxology,” should be well-known to anyone raised in a Christian church in the U.S. There are also frequent “singing schools” and two yearly week-long camps held within driving distance: Camp Fasola in Nauvoo, Alabama (a second session in 2009 will be held in Anniston), and Camp Doremi (seven-shape system) held at Wildacres Retreat in Little Switzerland, North Carolina. More information about local singings and events can be found at www.atlantasacredharp.org, and national listings, resources, and general information about shape-note can be found at fasola.org. Come on down. Bring a covered dish. And sing loud. Singers as well as song leaders mark time with their hands in a characteristic style. I just tried shapenote singing for the first time last weekend. Really enjoyed it! The group I attended ran the event like a well-oiled machine. Haloo! The man in the blue sweater is Raymond Hamrick, and the man next to him in the greeny shirt is Hugh McGraw. A formidable duo!